In the long run, sea-level rise will be one of the most serious consequences of global warming. But how fast will sea levels rise? Model simulations are still associated with considerable uncertainty – too complex and varied are the processes that contribute to the increase. A just-published survey of 90 sea-level experts from 18 countries now reveals what amount of sea-level rise the wider expert community expects. With successful, strong mitigation measures, the experts expect a likely rise of 40-60 cm in this century and 60-100 cm by the year 2300. With unmitigated warming, however, the likely range is 70-120 cm by 2100 and two to three meters by the year 2300. Complex problems often cannot simply be answered with computer models. Experts form their views on a topic from the totality of their expertise – which includes knowledge of observational findings and model results, as well as their understanding of the methodological strengths and weaknesses of the various studies. Such expertise results from years of study of a topic, through ones own research, through following the scientific literature and through the ongoing critical discussion process with colleagues at conferences. For many topics it would be interesting for the public to know what the expert community thinks. If I had a dangerous disease, I would give a lot to learn what the best specialists from around the world think about it. Mostly, however, this expertise is not transparent to outsiders. The media only offer a rather selective window into experts’ minds. More transparency can be achieved through systematic surveys of experts. The International Council of Scientific Academies (InterAcademy Council, IAC) in its review of IPCC procedures recommended in 2010: “Where practical, formal expert elicitation procedures should be used to obtain subjective probabilities for key results”. We took this advice and last November conducted a broad expert survey on future sea-level rise, in the context of a research project funded by NOAA. Lead author is Ben Horton (Rutgers University), the further authors are Simon Engelhart (University of Rhode Island) and Andrew Kemp (Tufts University). The credibility of such surveys stands and falls with the selection of experts (see Gavin’s article A new survey of scientists). It is important to identify relevant experts using objective criteria. For us, formal criteria such as professorships were not relevant; our objective was to reach active sea-level researchers. To this end we used the scientific publication database Web of Science of Thomson Reuters and let it generate a list of the 500 researchers who had published the most papers for the search term “sea level” in the last five years in the peer-reviewed literature. It was found that at least 6 publications were required for a scientist to make it onto this list. For 360 of those experts we were able to find email addresses. We asked those for their estimates of the sea-level rise from 2000 to 2100 and 2300, both the “likely” rise (17th to 83rd percentile) and the range of the 5th to the 95th percentile (the 95th percentile is the increase which with 95 % probability will not be exceeded, according to the expert). 90 experts from 18 countries provided their responses. Figure 1: Sea level rise according to the IPCC report of 2013. Shown is the past history of sea level since the year 1700 from proxy data (sediments, purple) and multiple records from tide gauge measurements. Light blue are the satellite data (from 1993). The two future scenarios mentioned in the text (RCP8.5 and RCP2.6) are shown in red and blue, with their “likely” uncertainty range according to the IPCC (meaning a 66 % probability to remain inside this range). Source: IPCC AR5 Fig. 13.27. A more detailed discussion of the IPCC sea level numbers can be found here. 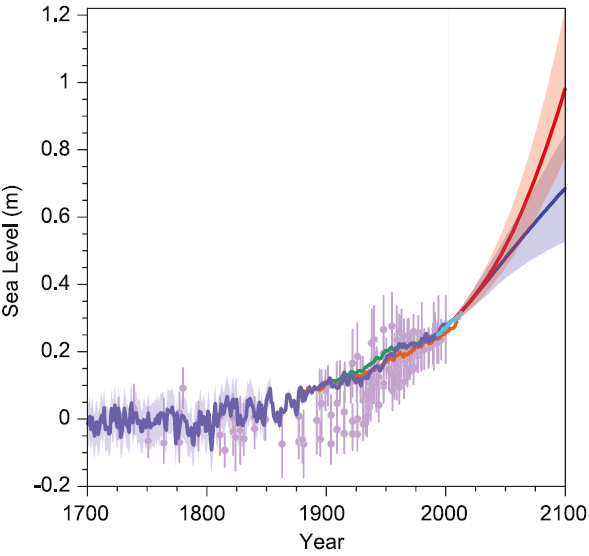 The red and blue future scenarios correspond (to good approximation) to the two climate scenarios on which we surveyed the experts: blue a scenario with effective climate mitigation, red a scenario with a further unabated growth of emissions into the 22nd Century. 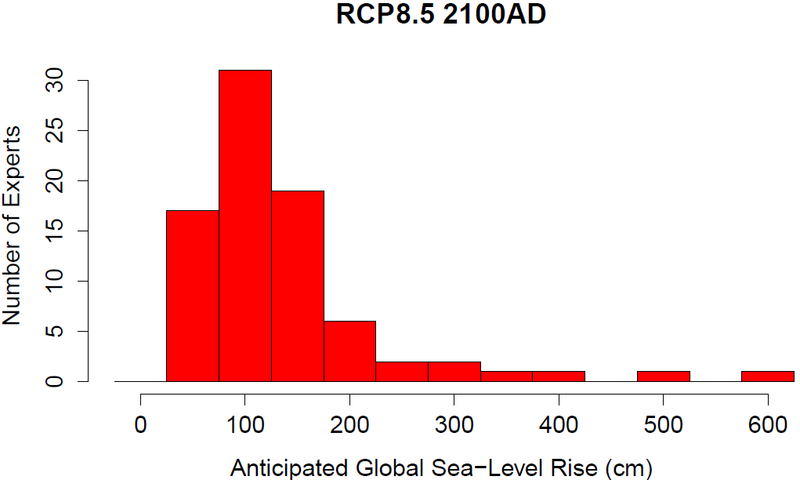 Figure 2: Sea level rise over the period 2000-2100 for two warming scenarios (red RCP8.5, blue RCP3). The ranges show the average numbers given across all the experts. The inner (darker) range shows the 17 to 83 percentile values, the outer range the 5 to 95th percentiles. For comparison we see the NOAA projections of December 2012 (dashed lines) and the new IPCC projections (bars on the right). Since this graph shows the increase from the year 2000, about 25 cm should be added for a direct numerical comparison with the previous graph. The experts gave a median rise of 40-60 cm for the blue climate scenario and 70-120 cm for the red scenario. Most of the experts thus expect a higher rise than the IPCC – about two-thirds (65%) give the upper limit for the red ‘likely’ range a higher value than the IPCC, even though the IPCC has increased its projections by ~60% since its last report of 2007. In expert circles the IPCC reports are widely considered to be conservative; this is empirical confirmation. Highly relevant for coastal protection is a “high-end” value that with high probability will not be exceeded – let’s say the 95th percentile in the table above, below which the rise will remain with 95 percent probability. For the red scenario, about half of the experts (51%) gave 1.5 meters or higher for this, a quarter (27%) even 2 meters or higher. This is for the increase from 2000 to 2100. In the longer term, for the increase from 2000 to the year 2300, the majority of experts (58%) give this high-end value as 4 meters or higher. These numbers reflect the fact that experts (including myself) have become more pessimistic about sea-level rise in recent years, in the light of new data and insights mainly concerning the dynamic response of the ice sheets. Experts quoted in the media are often chosen according to media needs – quite popular is the presentation of topics as a controversy with one expert pro and one against. In this way the experts are portrayed as divided into “two camps”, regardless of whether this reflects the reality. This “two-camps theory” is then used as a justification to cite (in the name of supposed balance) counter-arguments by “climate skeptics” with doubtful expertise. Especially in the US this “false balance” phenomenon is widespread. In the distribution of expert estimates we find no evidence in support of the two-camps theory, as shown in the following graph. There is no split into two groups that could be termed “alarmists” and “skeptics” – this idea can thus be regarded as empirically falsified. That is consistent with other surveys, such as that of continental ice experts by Bamber & Aspinell (Nature Climate Change 2013). Instead, we see in the distribution of responses a broad scientific “mainstream” with a normal spread (the large hump of three bars centered on 100 cm, in which I also find myself), complemented with a long tail of about a dozen “pessimists” who are worried about a much larger sea-level rise. Let’s hope these outliers are wrong. At least I don’t see a plausible physical mechanism for such a rapid rise. And the Washington Post: How high will sea levels rise? Let’s ask the experts. Thanks, I’m very glad to see this. It beats just complaining about the IPCC’s “Principle of Least Drama”. Still, given an unexpected collapse of any significant ice formation in Antarctica, all bets are off, right? Given the abysmal track record main stream scientists have in their impact projections, I’m surprised Stefan hasn’t abandoned that moderate group. And, there are still two groups but not the Skeptics and the Alarmists as outlined above. These two groups are the Hopeful and the Realists. The hopeful refuse to believe how bad it’s become – I can’t tell you how often I’ve heard the phrase “I just won’t believe it” coming from many in the world of environmental science regardless of the physical evidence before them. From my understanding of his stance, what Richard Alley has been saying would be completely missed by survey. His main point, as I understand it, is that we have to keep in mind even relatively unlikely outcomes if those involve potentially catastrophic consequences. If you are planning a trip that involves air travel and you find out that one airline has a crash rate of .01% and another .1% (these are just hypothetical numbers; planes are much safer than this), you are going to choose the former, even if you are considering one-in-on-thousand chances because the consequences are so dire/fatal. And that involves only the lives of one (or a few) people. If there is only a very remote chance of abrupt sea level rise in the coming decades, planners still need to know what those risks are, since this involves lives of hundreds of millions to billions of people. It’s the old odds-versus-stakes distinction. So it would be useful (perhaps as a follow-up survey to this interesting one) to ask what the highest _possible_ SLR is the judgment of these experts, even if likelihood of those levels coming about is well below 5%. But perhaps I’ve missed or misinterpreted something? James Hansen has been saying for some years now that multi-metre sea level rise is likely this century, because it will be non-linear and will come from the great ice-sheets in Antarctica and Greenland. Would be good to know what you all, both in Real Climate, and those commenting, think about his views specifically on this. I’m not a climate scientist or expert in changing sea levels but am aware that both climate change and (therefore) sea level rise may be characterized by lag and threshold effects. These could result in sudden breaks from linear or other smooth change, including rapid potentially catastrophic events. I can understand why the curves produced in this article do not reflect such unpredictable discontinuities but am puzzled as to why the article does not deal more deeply with this possibility and its implications. Should we not be “expecting the unexpected”? Is discontinuous change really so unlikely that respondents to this survey didn’t raise the possibility? The assumption of gradual, smooth change carries with it (at least among many policy makers) the assumption that, should a response become necessary, reversing negative trends will be similarly smooth and predictable. This could prove to be a dangerous illusion. As far as I’m aware, there is no analogue in the geological record for such a rapid global warming as we’re seeing now. The world warmed around 5°C in 10,000 years since the last glacial maximum – that’s 0.005°C per decade on average. Current global warming is nearly 0.2°C per decade – 40 times faster. If peak sea level rise was 4m per century during the last deglaciation, with a *much* slower global warming, why is no-one considering this rate is even possible due to anthropogenic global warming? Is it simply because there is less ice on the planet now, or that the ice which melted since the LGM was somehow more vulnerable to rapid collapse? In a National Geographic article last May on CO2 reaching the 400 ppm milestone they interviewed Maureen Raymo on conditions during the Pliocene when it was last that high. Her best estimate of sea level then was between 10 and 20 meters higher than now. Which makes me wonder how likely is it that SLR on that scale is already baked in and it’s just a matter of how long it will take to get there? Perhaps! I live in the greater Miami area so I guess I should at least be somewhat concerned and I am. However as someone who has spent over 35 years diving on coral reefs I should probably be happy about all the new areas for corals to populate. Unfortunately anthropogenically produced CO2 is causing something much worse than global warming and sea level rise. It is causing significant drops in the pH of the oceans. That is basically a death sentence to marine ecosystems as we currently know them. The ocean ecosystems are dying! I hope everyone enjoys eating their jellyfish burgers in the future. Figure 3 makes me very curious for the results up to 2300. How many experts think SLR could be more than 4m by 2300 and how high do their estimates for the 95th percentile go? Well, maybe. You dropped 150 experts because of no email and dropped another 260 because of no response. The final number is a sample of less than 20% of the experts. The final sample size is under a 100 so margin of error is greater than 10% but that is before you take in consideration there may have been a self-selection of experts that didn’t respond. How do you know most of the non-respondents were more optimistic about sea level rise and were wary of the intent of the survey? Any idea why the poor response? The response requested didn’t seem unduly burdensome. Was there are any followup emails or attempts to call or contact in other ways? I am gratified to see that in Figure 3, something like a dozen experts acknowledge that for the RCP 8.5 83%CL case there is a risk of equaling or exceeding 2m of SLR this century. Also, I note that by common usage the term “abrupt” (w.r.t. SLR) implies that “mainstream” experts would be surprised to observe such a response to AGW; nevertheless, the Earth’s circulatory steams are inherently chaotic, and chaos theory clearly demonstrates that such systems can be subject to “strange attractors” that can increase the probability of occurrence of phenomenon towards the tail of a “fat-tailed” probability density function (PDF), such as that shown in Figure 3. (1) Parizek, B. R. Christianson, K., Anandakrishnan, S., Alley, R. B., Walker, R. T., Edwards, R. A., Wolfe, D. S., Bertini, G. T., Rinehart, S. K., . Bindschadler, R. A., and Nowicki, S. M. J., (2013), “Dynamic (in)stability of Thwaites Glacier, West Antarctica”, Journal of Geophysical Research, Article first published online: 16 MAY 2013, DOI: 10.1002/jgrf.20044. (3) Groh, A., Ewert, H., Scheinert, M., Fritsche, M., Rulke, A., Richter, A., Rosenau, R., and Dietrich, R., (2012), “An investigation of Glacial Isostatic Adjustment over the Amundsen Sea sector, West Antarctica”, Global and Planetary Change, December, Vols. 98-99, pp 45-53, http://dx.doi.org/10.1016/j.gloplacha.2012.08.001. Any idea what group that would be? I could guess — emeritus authors who haven’t published since email came into use? or simply those who are not designated as the “corresponding author” in published work, who might be more senior but still active? Did you work with the “corresponding author” information that accompanies most papers, at least nowadays — and ask those designated authors to pass surveys on or refer their coauthors to the survey? Also, was ‘prefer not to state an opinion’ an option for those replying? The rate of retreat of LGM ice-sheets is still a matter for debate but indeed is highly relevant to our understanding of W. Antarctic icesheet collapse through the 21st century and its implications for SLR. A big project is currently under way in the UK (BRITICE-CHRONO) to try and better understand the rate of retreat of the British and Irish Ice Sheet (BIIS) after the LGM for exactly this reason; the data will be given to ice sheet modellers who hope to better estimate the trends we might witness in coming years in Antarctica. More info here: http://www.sheffield.ac.uk/geography/research/britice-chrono/home and here: http://briticechronoblog.wordpress.com/posts/ if interested. I would say Hansen’s multiple-meter SLR argument, using the IPCC meanings, resides closer to the less possible side of unlikely than it is to likely: somewhere between very unlikely (10%) and unlikely (33%). Others may disagree. It’s commonly described as his SLR prediction/forecast. “Preliminary Analysis of a Global Drought Time Series” by Barton Paul Levenson, not yet published. Under BAU [Business As Usual], agriculture and civilization will collapse some time between 2050 and 2055 due to drought/desertification caused by GW [Global Warming]. If Homo Sapiens is extinct or reduced to less than a million persons by 2060, sea level rise after 2060 has no consequence. The effect on agriculture is the most serious consequence. GW moves the rain, and that is what killed many civilizations in the past. Thanks 5 William E. Rees for mentioning the bad assumptions and lack of mathematicality of policy makers. Watching the financial news, I see the wealthy still clinging to the idea that unlimited growth is still a necessity and expected. Hi, Im not a climate scientist, but I take an interest in the whole issue of climate change. I have a comment on rapid sea level rise in the past. I recently read a book called “After the Ice” a book discussing human civilisation as the last ice age ended, around 20,000 years ago. Its written by an eminent archaeologist. The book discusses sea level rise spread over several centuries at slow rates but there is clear evidence presented in this book of a couple of periods of rapid sea level rise. The book noted a period where sea level rose at several metres per century which is clearly rapid. I stand to be corrected but at one point I think it it talked about a metre per decade at least in relation to Australia. Remains were found in Australia of settlements relocating to higher ground several times over. I cant recall the mechanism causing this burst of rapid rise, but it seems plausible that it could happen to us. Read more than the first page of search results; once you get several pages into them, you’ll find much more than the first page of most popular results — interesting slide sets, frothing mad attacks on the precautionary principle, poignant reminders that Cassandra was right. Beyond the direct melting of the ice sheets by warmer air, what are some of the forcings and feedbacks that may accelerate (or decelerate) slr? One feedback that I have only rarely heard discussed is the effect that the drop in elevation of, for example, the Greenland Ice sheet will have on the melting at the top. At first a very tiny effect, I would think that it would become more and more of a driver as the highest elevation started to fall to lower and lower, and therefore warmer and warmer, elevations. I don’t know how big of a factor this is in the big scheme of things, though. On the other side are possible increase of snow fall in some areas, impediments to movement of ice to the sea such as mountain ranges (especially relevant in the GIS) and underwater ridges…what else? The question is, what is the relative importance of each of these, especially in the relatively short term. In the relevant chapter of the AR5, there is discussion of, for example, the MISI hypothesis, which could, under the ‘wrong’ circumstances, accelerate SLR more rapidly. The AR5 decides to give medium-low confidence since the hypothesis at the time of writing was relatively untested. In the few weeks/months of interim publishing, several papers have come out which, at first glance, support the MISI hypothesis with evidence or processes already under way (such as mid-level oceanic warming undercutting the PIG and Thwaites, amongst others. Also to be considered is the Greenland Ice sheet ‘tipping point. Estimates range from 0.9c to 3c+ as a point beyond which Greenland is committed to long term SLR; however, this cannot exceed certain levels for purely physical reasons, so the WAIS (or rapidly accelerated global ocean warming) would be the only reasonable cuprits for a faster and larger range than about 1m to 2100. Most researchers have been trained to be “Frequentists”, demanding repeatability of observations in order to determine probabilities of occurrence. Such researchers then proceed to rely on Global/Regional/Local Circulation Models in order to make projections of modern SLR even when these same models have not been able to reproduce numerous examples of abrupt SLR found in the paleo-record, thus clearly indicating that current models are not capable of identifying the modern risk of abrupt SLR. As risk is equal to the probability of occurrence times consequences; I submit that the likely worldwide consequences of abrupt SLR demands the adoption/acceptance of a high confidence level (CL) that such an event will not occur (i.e. adoption/acceptance of the Precautionary Principle). Furthermore, I believe that the adoption/acceptance of the Precautionary Principle justifies the use of Bayesian methodology for determining the risks of abrupt SLR, particularly as there is only one AGW experiment that we can conduct on Earth this century, and thus there is no opportunity to conduct the repeatable observations that “Frequentists” demand in order to assess such “fat-tailed” risks. Thus as most researchers are “Frequentists” it is not surprising that they are not yet convinced of the risks of abrupt SLR; however, society as a whole should feel very uneasy that these same researchers are unable to prove that abrupt SLR will not occur this century. This implies major instability in components of both the Greenland and Antarctic Ice Sheets at temperatures likely to prevail by 2100, except perhaps at the lowest-emission scenario that we’re rapidly pulling away from. Since I put a lot of weight on paleo evidence for how the ice sheets have behaved in the past under somewhat analogous conditions, count me as a pessimist. Thanks for the post, Stefan. Clearly, this is an important study that complements the assessments of the new IPCC report. 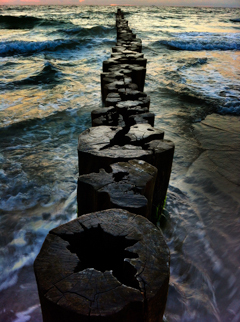 It is good to get an objective measure on the feelings of sea level experts. We must ask what is the basis for experts’ beliefs on what the sea level may be in 100 or 200 years from now? For example, how much confidence can we really have in results from ice sheet models, which very likely miss important mechanisms (e.g., due to limited understanding of ocean-ice shelf interactions, calving physics and influence of small-scale topography)? Different individuals will have different ways of valuing uncertainty in models etc, and this will reflect the results of these kinds of studies. So, the question remains: how much can we trust the experts’ beliefs on these issues? I have spoken to Dr. Hansen about his sea level forecast. He says that BAU is an huge forcing that he truly hopes doesn’t come to pass, but if it does he thinks that 2 to 5m SLR by 2100 or shortly thereafter is likely. Separately, Dr. Hansen has pointed out that Greenland is losing ice at an accelerating rate and it appears to have a doubling time of between 5 and 10 years, though there is not enough GRACE satellite data to confirm that yet (and I don’t believe there is any data to refute it). 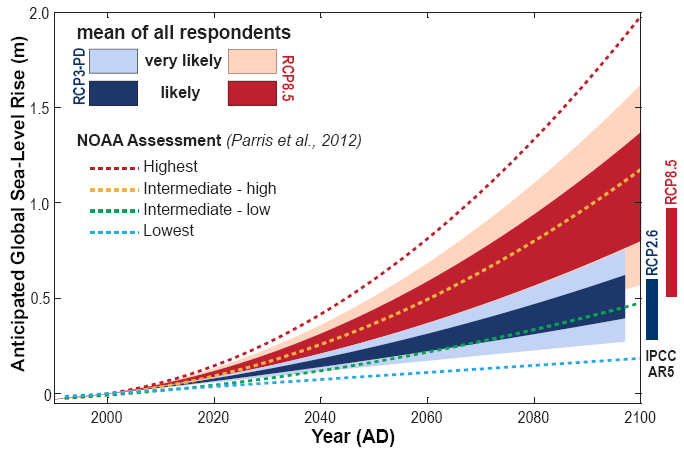 If Greenland melt is indeed doubling every 5 to 10 years, then there will be 1m SLR by MID-CENTURY! Thanks, that’s exactly what I was asking about. From the paper it appears there is a sea level plateau between ~400 ppm to ~650 ppm CO2 that is around 20 meters +/- 10 m higher than today. Most of the plateau appears to be because the East Antarctic Ice Sheet remains pretty stable until around 650 ppm. So the bad news is there’s probably 10 to 20 meters of SLR already baked in but the good news is we can stabilize sea level there if we keep CO2 well under 650 ppm. To state the obvious, I would like to note that RCP 8.5 was calibrated without the full methane contribution from permafrost degradation (for this level of radiative forcing), and was calibrated on the expectation that the global warming potential, GPW, of methane is approximately 25, while Shindell et al have shown that the GPW of methane considering atmospheric chemistry is at least 35 (see references at bottom of post). Furthermore, I suspect that now that the world (particularly China) has seen that the USA has cut its CO₂ emissions by using more methane produced by hydrofracking; that the rest of the world will soon follow USA’s example to significantly expand dependence on methane via hydrofracking. Unfortunately, I believe that the rest of the world on average will have higher methane leakage rates from the hydrofracking and transmission operations than for those in the USA; which I believe, will significantly increase methane concentrations in the atmosphere over the next several decades. If this scenario (of an increase in atmospheric methane concentration both due to anthropogenic and permafrost sources) were to occur, then atmospheric chemistry would increase the GPW of methane well above 35. I also note that if Asia (particularly China) converts its many existing coal-fired power plants to methane (from hydrofracking) over the next few decades, then the air pollution in this part of the world will likely be reduced, which would further increase radiative forcing on the Earth. Figures 1 and 2 of the post are referenced to the year 2000; however, since 2000 the world has been on an anthropogenic emissions path leading to at least a 5oC mean global temperature rise by 2100. A “Frequentist” would say that there is a low probability of this trend continuing into the future, while a Bayesianist would believe that this trend is likely to continue unless large efforts are made to de-rail this trend. Furthermore, the post demonstrates that the IPCC process is conservative compared to expert opinion; which supports my belief that RCP 8.5 may likely also prove to be conservative (w.r.t. actual future radiative forcing). Therefore, while the expert opinions of SLR for RCP 8.5 is a valuable benchmark; these assessments likely do not capture the full range of actual risk of abrupt SLR, particularly if nations choose to reduce CO₂ emissions by increasing dependence on methane from hydrofracking (particularly when considering the associated positive feedback from Arctic amplification). (1) Schuur, E.A.G. and Abbott, B., (2011), “High risk of permafrost thaw”, Nature, 480, 32-33, Dec. 2011. (2) Shindell, D.T., Faluvegi, G., Koch, D.M., Schmidt, G.A., Unger, N., and Bauer S.E. (2009), “Improved Attribution of Climate Forcing to Emissions” Science, Vol. 326 no. 5953 pp. 716-718, DOI: 10.1126/science.1174760. (3) Shindell, D.T., O. Pechony, A. Voulgarakis, G. Faluvegi, L. Nazarenko, J.-F. Lamarque, K. Bowman, G. Milly, B. Kovari, R. Ruedy, and G. Schmidt, (2013), “Interactive ozone and methane chemistry in GISS-E2 historical and future climate simulations”, Atmos. Chem. Phys., 13, 2653-2689, doi:10.5194/acp-13-2653-2013. Just look in the supplementary materials. I counted 23 experts that give numbers above 4m for 2300 given the high warming scenario (the three highest numbers 10,12 and 15 meters). Is anybody checking the reliability of these posts? The sea level contribution from glacial sources has been accelerating during the 21st Century. This contribution is not distributed uniformly across the world’s oceans due to both oceanographic and gravitational effects. We compute the sea level signature of 21st Century ice mass ﬂuxes due to changes in the gravity ﬁeld and Earth’s rotation. Mass loss from Greenland results in a relative sea level (RSL) reduction for much of North Western Europe and Eastern Canada. RSL rise from this source is concentrated around South America. Losses in West Antarctica marginally compensate for this and produce maxima along the coastlines of North America, Australia and Oceania. The combined far-ﬁeld pattern of wastage from all ice melt sources, is dominated by losses from the ice sheets and results in maxima at latitudes between ±40º across the Paciﬁc and Indian Oceans, affecting particularly vulnerable land masses in Oceania. The spatial pattern of RSL variations due to the observed ice mass loss is temporally invariant. Thus, sea level rise from the present-day distribution of ice loss will be amplified for this sensitive region. Sea-level changes due to ice mass loss are not distributed uniformly over the oceans. Instead, they give rise to characteristic regional patterns that are dependent on the location of the melt sources, and are therefore referred to as “fingerprints”. Regional variations arise because the Earth’s gravity field is affected in multiple ways by the melt of ice, due to the direct effect of surface mass changes (the gravity field is determined by the distribution of mass), the consequent deformation of the Solid Earth (removing a load causes the Earth’s surface to rebound, which in turn changes the distribution of the Earth’s mass), the consequent redistribution of ocean water (the ocean surface is shaped by the gravity filed) and perturbations of the Earth’s rotation axis (because of mass redistribution). Moreover, solid earth deformation and redistribution of ocean water influence each other, because the ocean represents a load on the Earth’s surface. According to both deterministic and semi-empirical studies, the rate of eustatic sea-level rise is likely to reach 0.4-0.6 m / century by AD 2100, but rates of up to 1 m / century are also possible if the most extreme climate projections are realised. Rates of sea-level rise of this magnitude are typical of a long term equilibrium response to environmental change (for example through glacial-interglacial cycles), but have not been witnessed during the historical past, and thus the consequence of these conditions for existing global ice-sheets remains unknown. From recent instrumental observations alone we are therefore unable to predict whether mass loss from these ice sheets will vary linearly with changes in the rate of sea-level rise, or if a non-linear response is more likely. In an attempt to address this shortcoming, we use a three-dimensional ice-sheet model to investigate glaciological changes taking place during the most recent period of 1 m / century sea-level rise, the last deglaciation (20 ka to present). Our experiments show a clear threshold in the relationship between the rate of sea-level rise, and the rate of (sea-level contributing) ice-sheet mass loss. Based on a statistical model fitted to our data, we show that at rates of sea-level rise below 1 m / century, Antarctic ice loss is linearly related to the combined effects of oceanic warming and rising sea levels, but above this threshold, the rate of ice loss increases significantly, and is driven primarily by the rate of sea-level rise, with ocean warming playing a lesser role. Perwis, thanks for the info. It seems I don’t have (free) access to the supplementary material; or am I missing something? Those are high numbers, even higher than Meehl et al 2012. So the worst case, according to one expert (was it Hansen? ), now seems to be about 15 meter of SLR by 2300. This would imply a maximum rate of SLR of at least 50-70 cm/decade for at least several decades at some point during the coming centuries. Most experts apparently think this is implausible, but on what grounds, and with what confidence, considering the unprecedented magnitude of a BAU-forcing? re: “A just-published survey of 90 sea-level experts …” – I did a survey recently and 9 out of 10 Dentists recommended the Oral B toothbrush. re: “These numbers reflect the FACT that EXPERTS (& PROFESSIONAL TRUTH TELLERS in SLR/Ice loss) have become more pessimistic about sea-level rise in recent years …” – Sept 2013 AR5 WGI does NOT reflect this FACT yet was published 8 weeks ago. That is a “fact” as well. re: “In the distribution of expert estimates we find no evidence in support of the **two-camps theory**, as shown in the following graph…” – first this arguing against a falsity put out by scientific incompetents and professional skeptics & deniers. There is NO two-camps THEORY it is spin and rhetoric not a “theory” so why raise this issue to such a high level that you WASTE YOUR RESOURCES giving a “scientific evidence based response”? Why defend yourself against a camp that is unconscionable to start with? You will not convince ONE skeptic nor will will one denier Blog, Murdoch press, Fox News nor Heartland ever agree in a public statement that there is no “two camps” and admit they are wrong. Why bother? The Allies of WW2 did not waste their resources trying to convince the German, Italian or Japanese people that the Allies were right and they were wrong. An IPPC Press Release that TRASHES the credibility of fools liars and idiots is enough. Name names and call them on rank Lies. No science or survey is required. Simply make a statement which LABELS it for what it is. The Public will GET that far easier and then pay more attention to the details over time. re: “– this idea can thus be regarded as empirically falsified.” – The majority of the Public would not know what “empirically falsified” means – it’s JARGON not effective communication to the Public. “Let’s hope these outliers are wrong.” – That’s Mystical thinking. It is not science based upon hard evidence. SLR is, or it is not. Degrees of Hope and personal opinions and feelings are all irrelevant. Most individuals won’t even consciously be aware of this “idea” forming in their own mind – it will happen by osmosis at a subconscious level. THis is what the professional deniers already know, and why it is they have been able to take advantage of the naivety of the Climate science and Academic community, and the IPCC lack of direct engagement in the public arena. You’re all too “nice” and “conciliatory” and “polite” because of falsely assuming that the rest of the world “think” like you and have the same “ethical values” and “human decency & respect for others” that you possess. That doesn’t mean that you have to be arrogant nor insulting. Only totally honest and blunt. Be utterly truthful and frank and in peoples faces who are incompetent and dishonest. Stop pulling your punches, and confront the Bullies in the Sand pit head on. No personal abuse of others needed, but only the truth will set you free here. Then the Public, the Media, and the Politicians WILL pay attention and will stop treating Climate Scientists like a bunch of waffling losers who can be kicked around IN PUBLIC for 25 years and yet never say a word in defense of THEMSELVES and Their HARD SCIENCE. Best to all. And that is a serious Problem to face and address in the Public Consciousness. Why? Because it actually proves to the general public’s standards that the Climate Science is again not settled and there is disagreement among them. That deluded thinking will then be used by the skeptics in their “marketing and promotions” to solidify that ‘public opinion’ further in the minds of the Media and the Politicians. Which then leads to further growth in the perception of the Public’s mind that their is something to this UNTRUTH, when in fact you already know that is BS and being grossly manipulated. Again and again the only Global representative body on Climate Change, the IPCC is missing in action. No Press Release to support either this survey and explain it, nor any Press Release to support and explain Cowtan and Way’s findings. No body offering to be interview on TV News nor Public Affairs programs. No letters to the Editor of the NYT to confront the lies that will be told about this before they get a chance to generate online negative activity and get into the Murdoch press. An analogy: Before D-day Eisenhower didn’t book an appointment with Goebbels nor Goring to discuss their differences in opinion about whether or not the Allies should invade Europe. Someone needs to tell Cowtan and Way (and everyone else like them) to get the f*** off of Curry’s blog site and every other denialist forum on the planet. Besides giving her false CREDIBILITY that is undeserved. This kind of response self-defeating, is a dead end, and an extremely foolhardy strategy that will fail. It already has imho. Robert Way would be well served by doing radio & TV interviews around the world and speaking directly tot eh Media and the Public. During that time he should take the opportunity to expose Curry and others for what they do. with no personal adhom nor ‘opinion’ needed. The continue on speaking CONFIDENTLY about his own specialty and expertise and what the SCIENCE and analysis shows from his hard high quality work. This is what I would like to see. Every day for the next decade. This WILL make a positive difference. This approach WILL shut down the anti-science blogs, the special interest groups and the ideological cabals that fund and support this “business model” of deceit and manipulation of the general public. Eventually. Maybe soone rthan anyone could imagine is possible. Just do not use people like Al Gore to do it. That makes it political and those who do not have levels of agreement with such political figures will not only shut off the message but will aggressively attack it relentlessly. Stick to the science and academic world. Find high quality writers and journalists and advertisers to write the “attention getting scripts” that everyday people will understand, absent the jargon and confusing semantics. Take Super Storm Sandy flooding and storm surge data across the landscape, and make visuals of that using Hydrologists and Meteorological data etc. Use the soon to arrive data regarding Haiyan typhoon, especially the two story high storm surges that acted like tsunami waves as base yardstick of what is possible in the most extreme similar event. Use the science to project SLR for this EXACT Location (and not global averages) on three levels – ie RCP3, RCP 8.5, plus the worst case scenario with zero mitigation and zero adaption ever. That is 9 variations shown in 9 separate Visualizations across the real world land surface of NE USA exactly where Sandy hit. Note the assumed destruction that would be caused. Set the scenario in High Tide only. Record the Storm Surge expected in both Feet and Metres at all times. Note the flooding in Feet and Metres too graduated across the landscape in colour. Note the total flooding surface areas in both Sq Miles and Sq Klms at all times. Be willing to make future Best ESTIMATES and ASSUMPTIONS that are NOT conservative but the MEAN Average of those. If This – Then That. Repeatedly highlight these are NOT Scientific Predictions but POSSIBLE Scenarios only. BUT BASED UPON hard scientific established FACTS and existing Data and cumulative Knowledge to date. Do the exact same thing for New Orleans using Katrina, and Miami FL using Hurricane Andrew as the base yardsticks. Do the exact same thing for Cities like Bangkok, Seattle WA, SW England, Shanghai, Guangzhou/Hong Kong, Mumbai, or anywhere else that suits. Then feel free to really become both pessimistic and more stridently motivated to take the debate over Climate Science up several notches immediately. The go hire David Attenborough to present a Documentary on the findings and interview those who did the work. ASAP before he moves on to another realm. Best to all. This comment is not directed at those people (the public visitors) who are above-average knowledgeable and frequent blogs like RC. As much as possible when addressing the Public, Climate Scientists and others please do stop speaking in numbers, averages, means, and other kinds of figures. The public believes the Ocean surface Sea-Levels are flat!!! They do not know that SL varies like the landscape of valleys, flats, hills and low mountain ranges and plateaus. They do not know that Naval Base Norfolk VA is the #1 location in the continental USA which WILL EXPERIENCE the most increase in SLR. They do not know what a 1C average mean increase in temperature means in REAL terms. It does not compute! They only universally understand the EFFECT of higher temperatures over time where they LIVE. iow the effect of extended Maximum Temps NOT averages globally. Not even Nationally where they live. Human beings THINK in Images not numbers. Human beings VISUALISE and Extrapolate what the meaning of words are. Words are required to articulate the Meaning of the Numbers, the Data, and the analysis of that data by the wizards in Climate Science. They do NOT need, nor want, nor can they handle the DATA. Stop talking about it, except among yourselves. Or when specifically asked by someone capable of understanding those Numbers and Maths. Respond to queries in WORD PICTURES and Visualizations of the CC AGW eGHG Effect. That immediately excludes ALL anti-climate science blogs and activists and such venues as Congressional hearings by Politicians and the Media across the Board. Just do NOT go there. Let the naysayers drown in their own “numbers”. Every number you put out they will find a way to undermine it and throw up a hundred other numbers which only confuse the Public even more. OK, some will no doubt LOL and will not believe what is being said here. What’s the strength of my credentials, expertise in this area, and authoritativeness beyond an over-confident highly opinionated personal pov? I have nothing to say about that, except a suggestion to go find a decent ‘cognitive scientist’ who you do trust and ask them. Or perhaps go view the series Mad Men. Yes the wiser ones are correct. I spent years swimming inside the goldfish bowl that is ‘marketing and advertising’ framed inside multi-national corporate culture, and on the Internet. Free Willy escaped! Seriously, stop and deeply think about this for a long time, and consider doing some historical research on the topic. As I understand it, Hansen has said that the paleoclimate record shows sea level rise as much as several metres per century is not unheard of. Why does Stefan see no plausible physical mechanism for multi-metre sea level rise? Are those data in the paleoclimate record not appropriate for our current situation? Multimeter sea level rise is a lower probability scenario despite having happened in the deglaciation. Remember that there was about 10 times the amount of ice on the Northern hemisphere during the multimeter sea level rise intervals of the deglaciation, so there was a larger reservoir to work with. However, somewhere between 0.5 m and 1.5 m by 2100 is very plausible, and ultimate rise of several meters could happen. Meanwhile probably some cities/countries will adapt in time to prevent big disasters from happening, but others will likely be too late, so disasters wil probably be bigger and more frequent. Since we can’t simply assume the world will become richer and richer, due to both climate change and resource depletion, these rising adaptation costs will at some point become an unbearable burden on public budgets. The less we invest in mitigation the sooner we will probably reach this point. But at the same time: the less we invest in adaptation, the more and bigger disasters will happen. So we need to invest more now, in both mitigation and adaptation, to prevent costs from becoming unbearable further into the future. This rather will lead to different RSL (Relative Sea Level), will not repeat the Meltwater pulse 1A scenario. However, the analog here is the beginning of the Pliocene, which had +2C higher temperatures with +15 meter higher sea level. See the explanation here by Hansen (at time marker 8:10min). As the studies above (#31) suggest, the Oceania region experience the current deglaciation impacts (Explains the European SLR paradox) and as suggested at a threshold of around 1.4-2.0C non-linear SLR impacts will be observed elsewhere too. Global impacts will likely occur from increasing volcanic activity, which could turn out very large as well. And you have to factor in the newly discovered underestimated global warming, which brings the threshold for non-linear behavior much closer. One priority should be to look at current locations of nuclear facilities and their vulnerability. “[T]here was about 10 times the amount of ice on the Northern hemisphere during the multimeter sea level rise intervals of the deglaciation”. On the other hand, globally there was only about 3 times more ice on the planet then as compared to now. And then the planet was warming on average about 0.005 degrees C per decade as compared to about 0.15 degrees per decade now. So this is about 30 times faster and will likely accelerate, as more and more positive feedback kick in. If it would warm 5 degrees this century, which seem quite possible, that would be about 100 times faster than the average rate during the last deglaciation, although I suppose ocean heat content rises somewhat slower. The warming then was instigated by higher insolation in the Northern hemisphere, where most of the ice was. The warming today is caused by higher CO2, which works globally, including in the Southern Hemisphere, where most of the ice is now. The total forcing back then was about 6-7 W/m2, including slow positive feedbacks, while the initial orbital forcing was about 20 times smaller, according to Hansen. The initial CO2/GHG-forcing now is already about 3 W/m2, so about 10 times higher then 20.000 years ago, and growing rapidly, if I understand correctly. This has been partly masked by a negative human aerosol forcing so far, but that masking will likely become smaller as more people will demand cleaner air. And slower positive feedbacks may already be starting to have an additional forcing now and a growing one during this century. All in all it seems quite possible that the forcing this century and after will be substantially stronger than during the last deglaciation. So less ice to melt now does not necessarily mean SLR will be slower than in the past, it seems, once it gets up to speed, and if we fail to reduce our emissions sufficiently. > All in all it seems quite possible that the forcing this century and after will be substantially stronger than during the last deglaciation. Yes, clearly. CO2 is on track for 450 before Big Carbon can be substantially slowed, and resistance to coal (but replacement with methane) is increasing so that the sulfate aerosol blanket will go away. This will be an unprecedented forcing in the life of our current ice caps, and CO2 may reach 500. Sean: “only”?? 3000 meters represents about 21 degrees C difference in temperature. Every meter of melt will make the surface warming, thus making the next meter of melt happen sooner…and so on and so forth. I don’t get this kind of response, unless AbruptSLR has been a prolific troll here, and i haven’t noticed that. The words you listed I have seen used by Gavin, Rasmus and Stefan at times, but do I need to word search it to prove that? The guys seems pretty polite, considerate, and provides refs and seems to be making genuine heartfelt “comments” in the “comments” section. If the ‘science’ or whatever is flawed or wrong or dubious isn’t the purpose of allowing comments created to address that? eg a meaningful response by Stefan the author of the article? I really don’t get this kind of slap down nor who it serves? So maybe there’s something I am missing or do not know. Maybe you’d be happier if the site went private and was invitation only, for those ‘qualified’ enough to handle these high end superior aspects of science? Just seems odd to me. Been a very regular reader here since 2006/2007. I have lost count of the times I have shared urls to this place publicly for the benefit of others. It didn’t used to be like this.